The ability of medium and heavyweight buildings to stay cooler during the summer by soaking up excess heat on warm days is fairly well understood. Perhaps less well known is that this daily cycle of absorbing and releasing heat continues on a year-round basis and can be used to reduce the energy needed to keep buildings warm during the heating season. This works through the ability of thermal mass to capture and recycle heat gains from south facing windows (known as passive solar design), along with those from lighting, people, appliances etc. As the temperature drops overnight, this is slowly released back into the building, helping keep it warm and reducing the need for supplementary heating. Whilst lightweight buildings are also capable of doing this to a limited degree, the extent to which free heat gains can be recycled increases with the level of thermal mass present. This is now recognised in SAP, which is the compliance tool for Part L1A of the Building Regulations, which deals with the conservation of fuel and power in new dwellings. 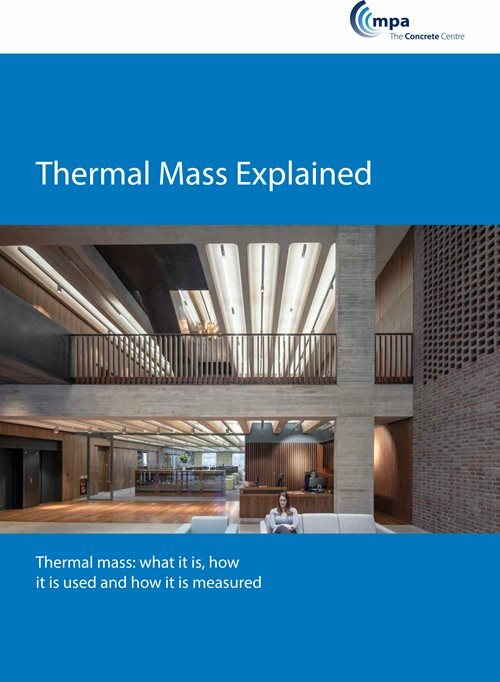 Graphic below is taken from Thermal Mass Explained. Download for more detailed information.